There was a time when restoring Porsche 944 GTRs were the specialty of the house. As a matter of fact, of the six 944 GTRs ever produced, three transited through Rivard Compétition at one point or another. Jacques acquired the 001 directly from Ludwig Heimrath jr with all parts. The car was restored and was sold in race-ready condition. Rivard Compétition bought both 944 from Bruce Jenner in parts. They were completely restored as they were originally. They were driven in Historic Sports Racing and eventually sold separately. In the early 1980s, Porsche commissioned the chassis builder Fabcar to develop a race version of the 944 Turbo. 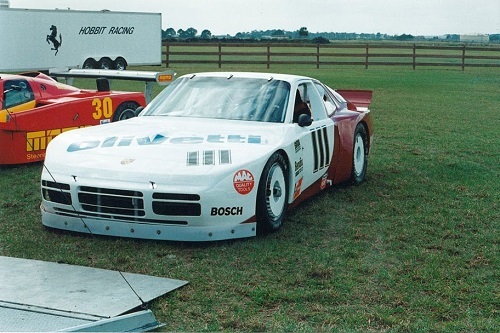 The conception of the seven tubular 944 GTR chassis was thus in the United States under the supervision of the five-time IMSA Camel GT champion Al Holbert. 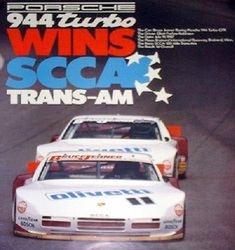 Fabcar ended up building seven 944 GTRs that were sold to private race teams. Toronto, Canada-based Ludwig Heimrath jr who had previously owned and driven several Porsches, including 935s and 924 GTRs, bought the 001 chassis. Heimrath jr raced his 944 GTR in a few Trans Am races in 1985 and 1986, but did not participate in all races. After the car was restored by Rivard competition, it raced extensively in Historic Sport Racing (HSR) during the 1990’s. The 005 and 006 chassis were purchased by New Zealander team owner Bruce Jenner. 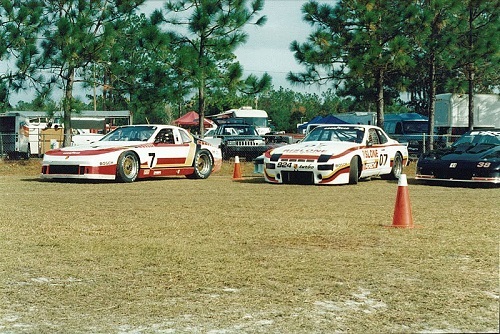 In 1987 and 1988, both 944 GTRs formed two/third of the Jenner Racing Trans Am team and raced under the Olivetti colours (white and burgundy). The 005 chassis driven by Elliott Forbes Robinson had number 11 and Bruce Jenner drove the 006 chassis (number 42). All in all, Elliott Forbes Robinson did pretty well in a 1987 season outrageously dominated by Scott Pruett’s Merkur XR4TI turbo. Here’s a little trivia: the 944 GTR driven by the great Elliott Forbes Robinson is the last Porsche to ever win a race in the Trans Am series and it took place in Breinard, Minnesota in 1987. No longer backed by Porsche, the 005 and 006 chassis entered the 1988 Trans Am season, but significantly lower budget translated into less mixed results. 1- The 001 944 GTR chassis (left) next to a 924 GTR that was also restored by Rivard competition. This picture was taken at an HSR event in Savanah, GA in 1992. 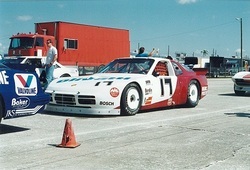 2- This is the 005 chassis, usually sporting number 11 and now sporting number 17, at an HSR event in Sebring, FL in 1994.